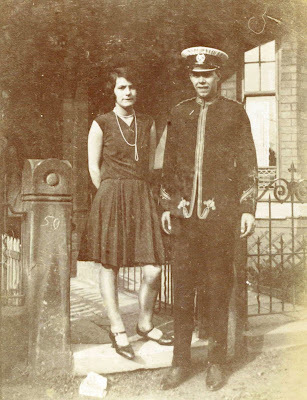 This is young Annie Magee aged fifteen in 1923 outside her home on what is now Ivy Green Road. It comes from a wonderful collection of photographs belonging to Peter McLoughlin whose parents lived and worked in Chorlton during the first half of the last century. Miss Magee was Peter’s mother. She was born in 1910, and married his father in 1946. Mr McLoughlin had lived at Brook Farm Dairy from 1920 and included in the collection are “pictures my Father with the horses outside the dairy which became Dobsons and latterly Express before its demolition. So there you have it the start of a new series featuring a collection of pictures which Peter has agreed to share and what’s more has the stories behind each one. Now that doesn’t always happen. Most of the ones I come across are just pictures without that personal aspect. 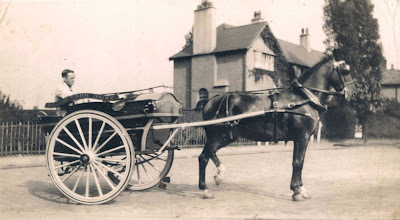 They tend to be either commercial photographs which were posed and were sold on to picture postcard companies or are long forgotten snaps found at the back of a cupboard without a date or even a name to identify the place or the individual. But Peter’s are different and point to just how important it is to preserve both the images and the stories which come with them. 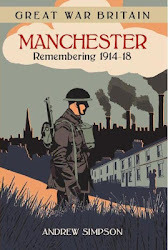 All of which is the start of a new series which with Peter’s permission will feature more of the collection and dig deep into the history of Chorlton and his family. After all the diary has long gone replaced by a set of smart town houses, and as memories fade it will not be that long before even the existence of Brook Dairy/Dobson’s/Express Diaries are lost forever. Equally there will few left who now know that long before it was a dairy it was a farm stretching back into the early part of the 19th century and most likely established during the century before. Peter and I will be meeting later in the week and I am looking forward to the history lesson and for now I will just close with a reflection on how important that old family album is.